An okay documentary, it’s great to see Siskel and Ebert arguing and to learn about the relationship between them, as well as that between Ebert and his wife, Chaz, but most of the other stuff in this film just feels like filler. An interesting movie, this documentary tells the story of Roger Ebert, one of the world’s most well-known film critics from start to end. The problem is that it doesn’t quite spend enough time in the middle, which is the most exciting part of his life. While there is definitely a good deal of content about him and Gene Siskel, there just isn’t enough about the way he reviewed movies. For example, Ebert did these shot by shot classes where he analyzed movies with students for days, going over every shot, and we hear about that, but never get to see even a moment of it. And yet we get to see the handicapped and severely disabled being painfully fed through a straw twice. The movie could have definitely been better. Roger Ebert was quite possibly the greatest film critic of all time. 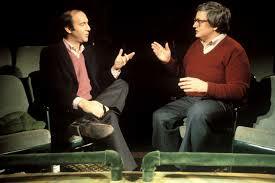 Hist television show, Siskel and Ebert, where he worked alongside partner Gene Siskel, was certainly revolutionary. The fact that it was met with the success that it was, is certainly a huge accomplishment, but even more important is how good and entertaining the show was. These two guys, who couldn’t look any more different from each other, just argued away about movies and their opinions of them. Well, now, some years after Ebert passed on comes a documentary about the man. 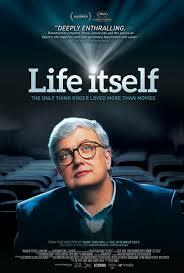 Life Itself is the story of Roger Ebert’s life. It’s definitely interesting, but there are also plenty of places where this movie could have been better. The story starts with telling us of Ebert as a child. He couldn’t play sports, but what he always could do is write. When he was a boy, Ebert received a stamp that printed the words BY ROGER EBERT when he stamped it. He would then go around the house stamping it on everything until his parents had to take it away. It’s little stories like this that comprise most of the movie. He was given the job as editor of the local newspaper and when Kennedy was assassinated, Ebert noticed that they were about to print a paper with a shotgun on one page and Kenney’s head on the next. He stopped the presses in order to get this changed. The problem here is that we don’t really find out how Ebert became the editor of a local paper. It’s as if he was just given that job. A little bit of background about what led up to that, including other jobs that he might have done and articles that he published, would have been nice. But this movie seems to be in a hurry to get going, at least in his early life. That’s strange considering that it’s a two hour film. Still, it wants to dive into the life Roger had before becoming a film critic, and it gets there relatively quickly. While working for the newspaper, Ebert used to travel around quite a bit, but when home, in Chicago, he always frequented the same local bar. This was a place where the newspaper men sat in one area of the bar, and the novelists in another and so forth. Ebert was a storyteller who was always buying rounds for people. As a result of that, the people felt obliged to sit down with him and listen to the stories he was telling. All of this is only moderately interesting. Ebert was also an alchohalic. That’s something I never knew about the man, but apparently he had it pretty bad. He used to walk home at night, after the bar shut down, and wish he was dead. Hangovers are the main reason why he decided to quit, and he put himself into Alcohalics Anonymous, never to have another drink again. And then one day, he was offered the job of film critic for the paper. Ebert says he didn’t apply for it, never sought it out, but instead was simply offered it when the former critic retired. Once again, like hearing about him becoming an editor earlier on in the film, this just isn’t enough information. If it really is true that he was just offered the job, then we need to know more about this offering. Did Ebert like movies before this? Did he make it known around the office that he liked them? When being offered the job, did his boss ask him about his interest in movies? None of these questions are ever answered. Instead, the movie spends more time talking about the Russ Meyers movie that Ebert wrote the script for than it does explaining how he became a film critic, or how he got involved with the newspaper. The Meyers movie was Beyond The Valley of the Dolls, and I’m glad that this documentary touched on that film, as it was clearly an important milestone in Ebert’s life, but it just seems to have its priorities mixed up. From here, we learn of Ebert meeting his wife, Chaz, at an AA meeting, and then of him winning a pullitzer prize for his writing. All this before learning of Gene Siskel and Ebert’s relationship or meeting with him. That’s strange considering how important Siskel was to Ebert’s life and how well known the two of them were as a team, but it really seems like the movie is saving Gene and holding back on showing him for as long as it can. It isn’t until nearly the second half of the film that we finally get to hear about the show we all came to know and love. Roger and Gene were enemies at first. They worked for rival newspapers and when offered the show, both wanted to do it with anyone else. Yet they took the job and this is where the documentary starts to get interesting. We do get a lot of stories about these two guys. We get to see them arguing about movies and also get to watch some behind the scenes footage of them arguing or making fun of each other. This is the best stuff in the movie. We also get interviews with filmmakers whose lives were effected by Ebert. The most notable of these is Martin Scorcese who found himself in a very bad place until Ebert offered to give him an award which was so powerful it lifted him up. The movie is filled with stories like this. Most of the better ones come in the second half. One of the most interesting stories involves an article that Richard Corliss wrote called the Siskel and Ebert effect. It was about how their show was ruining film criticism by making every movie seem like it was simply either good or bad, no in between. That was the result of the quick reviews and the thumbs up or thumbs down mantra. A lot of the movie goes into the surgeries Roger had which plagued the later portions of his life. The hospitalized and disfigured Ebert is shown throughout the film, with his jaw hanging off his face, and a hold going through his skin, where his mouth is. This is all fine, but the problem is that the movie spends too much time with it, to the point where we watch him being painfully fed through straws on two separate occasions. Now there’s plenty else they could have been showing us and didn’t show us, instead of this. Ebert used to lead a college course where he would take students through a film analyzing it on a shot by shot basis, for example. We hear about this, but never see it. How nice it would have been to see him analyzing a shot with students or playing and then freezing a movie in order to study it. Moments like this are missed from a film that seems more interested in the surgeries than about how the man became who he was. It’s definitely an entertaining film, but it could have been a whole lot more.